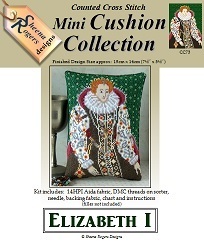 Queen Elizabeth I with her red hair and jewel encrusted dress is the subject of this mini cushion design, with an emerald green tudor style background. Only whole cross stitch is used (so no fractionals), with a little backstitch used for the facial features and hand details. 20 shades of DMC thread are used within the design. This mini cushion cross stitch kit includes: 14HPI white aida fabric, DMC stranded cotton threads ready-sorted on a card sorter (which includes the symbols beside the colour numbers), needle, black velvet backing fabric, b&w symbol chart and full instructions (cushion filler not included).